After enabling the new experience, the plan will have the new layout. As a Portfolio for Jira user, you'll need to enable the new experience in your individual plans. Even if this is already enabled in your Jira instance, your plan will not get the new interface until this is enabled in the plan itself. 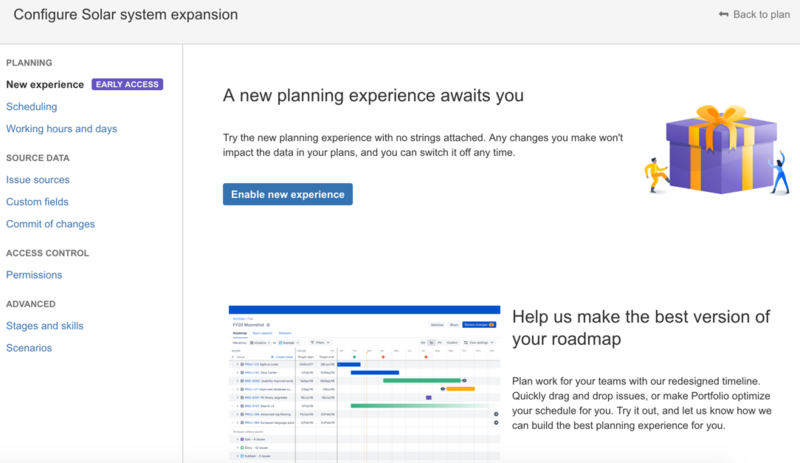 Click more ( ) > Try the new planning experience. The plan configuration page will display. Click Enable new experience to switch on the new interface for your plan. To stop using the new experience in a plan, from the plan configuration page, click New experience > Disable new experience.